The hydro-electric scheme at Shannon was officially inaugurated by the Prime Minister and the Minister of Public Works to-day in the presence of 1,500 people, including a party of parliamentarians…. The Mayor (Mr Murdoch) … said he looked forward to the time when every house in the Dominion would be lit by electricity …. The Otaki Dairy Company Ltd butter factory machinery is to-day being driven by electric power from Mangahao. The company has installed two motors – one twenty and one ten horse power, and these have commenced their work without a hitch and are running very smoothly. The Otaki Dairy Company is the first to use the Mangahao power for dairy factory work. With the advent of the electric light, we wish to apologise to our many customers for the inconvenience they have had to suffer through poor light and to thank them for continued patronage; we guarantee them that so long as the electric current is available we shall always have a well lighted shop. The last public meeting of the year will be held at 7.30 pm on Tuesday 2 December at Rotary Hall in Aotaki Street. The speaker will be Chris Maclean, who will talk about his latest book Tramping: A New Zealand History. Co-authored with Shaun Barnett, this book tells the story of the development of tramping in New Zealand beginning with Maori and early Europeans, then discussing the state-sponsored tracks and huts in the late nineteenth century, the first tramping clubs and much more. At this meeting the Society’s 2014 Journal will be launched, and a festive supper will be served. From 4 December there will be new material to see in the exhibition “Otaki Remembers World War I”. While the Roll of Honour and the popular horse will remain, there will be a new focus on several people. Some of them returned to Otaki – Rikihana Carkeek and Harry Edhouse for example – while others, like Robert Staveley, died in the service of their country. There will also be a display on the ship Otaki, sunk in 1917. The Otaki Museum is at 49 Main Street and is open Thursdays, Fridays and Saturdays 10 am – 2 pm. 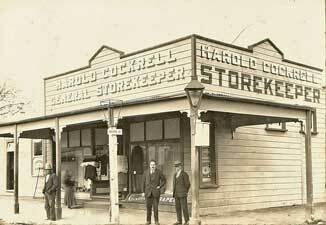 Cockrell’s general store on the corner of Main and Matene Streets c1919, with a carbide (acetylene gas) street light.